Starring: Liam Hemsworth, Jeff Goldblum, Jessie T. Usher, Bill Pullman, Maika Monroe, William Fichtner, and more. If you have not already realized, we are in an age of remakes and sequels. Original material can be a rare occurrence in the film industry and are usually refreshing and enjoyable but regardless, most films that do well in the box office nowadays are something we have seen before. Next to join the list of 2016 sequels (that probably should not have been done, but hey, money) is ‘Independence Day: Resurgence’. There has been a lot of buzz revolving around this title. Some good, some bad, but no matter what side of the scale you may fall on, one thing is for certain; you are going to read my opinion on it! *evil laugh. Sorry, after watching this film, it has me feeling some type of way… Let us just get to it, shall we? ‘Independence Day: Resurgence’ begins in… errr.. a multitude of locations. Just kidding, it starts in one place but jumps around a lot… We will get to that… Anyway… The film starts off picking up where the first left off yet twenty years post-attack, but also introducing new and old faces to the mix. We get updated on the status of Steven Hiller, learn of his son, Dylan Hiller (Jessie T. Usher), are filled in on who Jake Morrison (Liam Hemsworth) is and what is his relation to current characters, and also learn of the status of many of the playmakers from the original movie like David Levinson (Jeff Goldblum), President Whitmore (Bill Pullman), Julius Levinson (Judd Hirsch), and many others. Beyond the character introductions and re-introductions, we as the audience are slowly informed on the status of the world since the first attack, yet many are skeptical that it is not over even though it has been twenty years. Strange occurrences begin and warning signs are received in a multitude of ways but none are acted upon until it is too late or mistakes were made. Attack number two begins as aliens attack the world and it is up to an ensemble of characters to defend humanity. That last sentence sounded like something straight out of ‘The Avengers’, did it not? Well, if you see this movie, that is not the only movie you might think of while watching ‘Independence Day: Resurgence’. This film is cliché to unreal measures, extremely predictable and illogical (even beyond the concept that we are dealing with aliens) to infuriating points. Characters you may have cared about in the original film become an afterthought. These new and young characters have zero screen presence to make you want to root for them. If you wish to see some epic humans vs. aliens combat; you picked the wrong movie. There is little of that beyond a few gunfights that are brief. The dogfights are a little entertaining, in my opinion, but that was the extent of entertaining action. This film is more of a disaster movie than an action/adventure. Which was another rare positive point that I will give beyond the mountain of negatives; the disaster aspect of the invasion is pretty cool and appealing to the eye, but that only goes so far. Another gripe I had early on was something I spoke on briefly earlier; the location jumps are overwhelming. Every new scene almost has a caption stating where the scene is taking places. Enough location jumps to give Nightcrawler a headache. You have seen this movie before, folks, its name is ‘Independence Day’. If you loved the original so much you can not resist missing out on the sequel that has been twenty years removed. Then by all means, give it your best shot. Otherwise, this film is absolutely juvenile in regards to overdone humor, illogical sequences, and non-linear plots as well as intertwining plots resulting in a underwhelming experience. 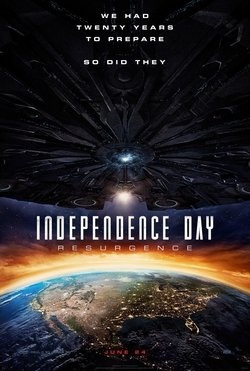 You are not ‘Finding Dory’, ‘Independence Day: Resurgence’.